* This is my column in BusinessWorld last January 22, 2019. There are many factors to frequent heavy traffic congestion in Metro Manila and other big cities in the provinces. This short article will narrow it down to five factors. People who live in many villages in Quezon City, Las Piñas and other cities and going to the big commercial and business districts (CBDs) in Makati, Taguig/BGC or Mandaluyong/Ortigas, taking public transportation means multiple rides: (1) tricycle from house to main roads, (2) jeep or bus to train station, (3) MRT or LRT ride, and (4) jeep or long walk to office or meeting places. Going back home, up to eight rides and people are already very tired coming home. Snatchers and other criminals, sexual molesters can occur in any of those rides or while walking between those six to eight rides. And it is worse during the rainy season. The solution is to drive their cars or motorcycles. People would rather brave the heavy traffic plus expensive parking fees than endure those multiple rides. Or take transport network vehicle services (TNVS) like Grab or any of its nine competitors now, or a regular taxi. 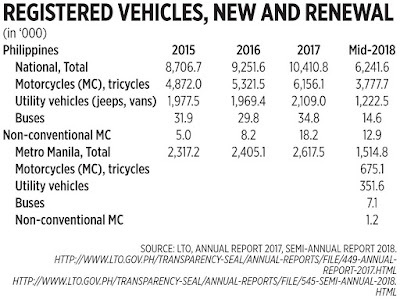 Below are official data from the Land Transportation Office (LTO). The total registered vehicles include government, diplomatic and for hire vehicles (77,241; 2,837; and 970,427 respectively, in 2017). 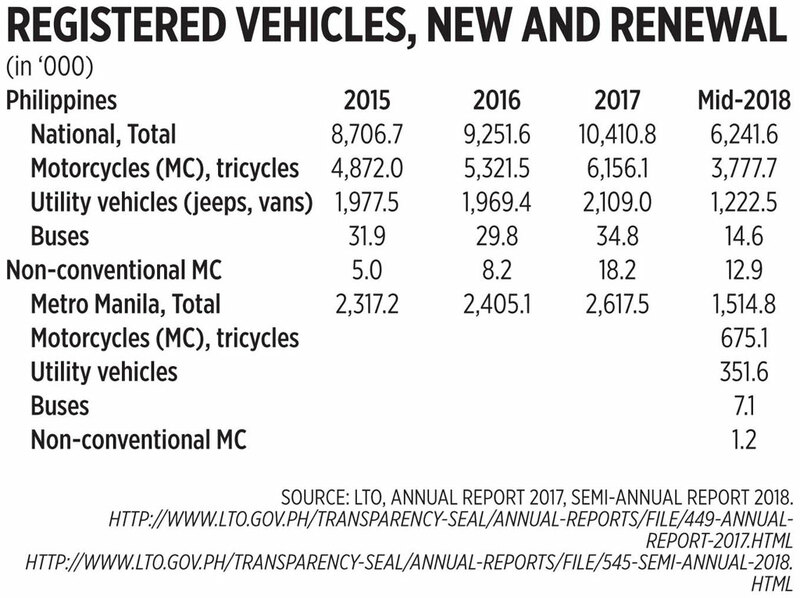 There are so many motorcycles and tricycles, 6.2 million in 2017 and probably 7.4 million in 2018. But there are not too many buses, only 34.8 million in 2017. There are many unregistered vehicles like the “colorum” jeepneys, taxi and buses, and unregistered motorcycles and tricycles like those used by many policemen who drive motorcycles with no plate. Now there are many point-to-point (P2P) buses with more routes, true. But people still need to ride tricycles or TNVS, taxi, etc. from their house to the P2P bus stations, so some people would still prefer to drive their cars. In the first 40 days of 2018, the Department of Transportation (DoTr) recorded a total of 33 MRT3 glitches, with imperiled passengers having to walk on rail tracks to get off. In addition, only 8-9 trains were running per day in February vs the minimum target of 15 working trains per day. Then the Dalian trains, of which out of 48 unused trains in 2017, only two were deployed as of December 2018. The Commission on Audit (CoA) report for 2017 showed that DoTr was unable to fully implement P46.6 billion out of P58.9 billion of funded projects due to frequent policy changes by political leaders and economic managers. Affected were 153 out of 159 DoTr projects like the Cebu Bus Rapid Transit, LRT Line 2 east extension, and LRT Line 1 north extension common station. As this column has discussed in previous articles, there are lots of bureaucracies and requirements from the LTFRB before existing TNVS can expand, which reduces the supply of cars and drivers. And there are bureaucracies from the PCC before failing and losing TNVS and TNCs can exit the country. Even exiting from business can cost huge money, so potential big players from abroad would be hesitant to come and do business here. The bigger the number of inconvenient public transportation like tricycles and jeepneys, the bigger the demand for private cars, which contributes to frequent traffic congestion. Even those “clean” e-trikes are still low-passenger tricycles. We need less of them, not more. We need more modern public transportation like efficient MRT/LRT, aircon buses and vans, and reliable TNVS. These reduce the need for private car use. And these investments require less bureaucracy, permits and business taxes, not more.